Work & Travel USA students enjoy their summer! InterExchange is a nonprofit organization with more than 40 years of experience promoting cultural awareness through a wide range of affordable and exciting work & travel, professional training, internship, au pair, camp, language learning, and volunteer programs within the U.S. and abroad. InterExchange is designated by the U.S. Department of State to sponsor a variety of J-1 Visa Exchange Visitor programs. To ensure a successful exchange visitor program, J-1 Visa participants and their hosts must follow all regulations set forth by the U.S. Department of State and maintain contact with InterExchange throughout their programs. A successful program also depends on U.S. hosts’ encouragement of cultural learning by introducing international exchange visitors to uniquely American values, customs, history, and activities while simultaneously learning about the countries and cultures of visiting participants. Similarly, international exchange visitors are expected to make a commitment to engaging in cultural learning opportunities in their local host communities throughout their programs. Strengthening these relationships makes achieving the goals of mutual cultural exchange possible and allows us to build a global community - one person at a time. InterExchange Work & Travel USA is a J-1 Visa program that offers international university students ages 18 to 28 the opportunity to live and work in the U.S. for three to four months during their summer vacation. Students work in hotels, inns, amusement parks, national parks, retail stores, ski resorts and numerous other seasonal establishments. They receive a wage, assistance with housing, accident and sickness insurance, program support and an optional month for travel to explore the United States. Work & Travel USA also offers a 12-month program for citizens of Australia and New Zealand. Camp USA places international participants, ages 18+, in U.S. summer camps in counselor or support staff positions. InterExchange also sponsors visas for returning staff or for participants who have found their own camp jobs. The Camp Counselor J-1 Visa is a four-month visa. The InterExchange Camp USA program runs between May 1st and October 15th during the program year. Working Abroad enables U.S. citizens, generally ages 18 to 30, to build diverse work experiences overseas. Opportunities include Au Pair, English language instruction, and work and travel placements. We offer programs in Australia, New Zealand, Asia, South America, and numerous European countries. 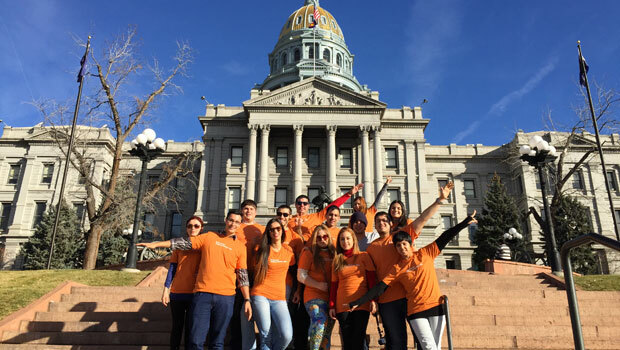 The InterExchange Foundation was established in 2007 to provide grant funding to motivated young Americans contributing to worthy work or volunteer projects abroad. The Working Abroad Grant supports participants of select InterExchange Working Abroad programs, and the Christianson Grant supports individuals who have sought out and arranged their own long-term work abroad programs. Many students study abroad every year, but far fewer take advantage of the opportunity to work, intern, or volunteer overseas. By providing financial assistance to talented candidates, we encourage young Americans to discover and contribute to the world and benefit from the unique and enriching insights one can only gain from living and working abroad.